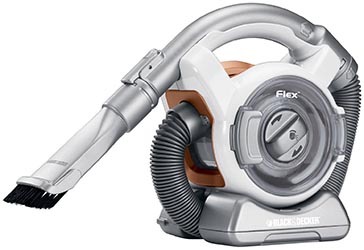 The Black and Decker FHV1200 Flex Vac is one of those more uncommon designs that end up looking a little like a sea creature with a circular shell. It’s one of the less expensive options in that oddly-shaped niche, though it supposedly has a new kind of lightweight, high-performance motor. Let’s find out whether Black and Decker has really made an affordable, flexible-hose handheld that still works well. It looks like that motor is able to generate a solid amount of power – 12 volts is a lot more than one might expect from a handheld vacuum in this price range. The question is, is the “high-performance” of the motor translated into actual, effective suction by the design? The answer, as it turns out, is a resounding yes – the Flex Vac has startlingly strong suction, and I’ve nary a complaint about this aspect of the vacuum at all. That same quality in design extends into the very nature of this handheld – instead of being one rigid piece like most handhelds, it has a four-foot flexible hose. This might not seem like too much of an advantage when you’re cleaning messes on the floor or even the counter, but just wait until the moment where you realize you can suddenly easily clean everything above you, from curtains to high shelves. And that’s not even mentioning not having to crawl and contort yourself inside your car – just extend the hose! I’m a little disappointed in Black and Decker for this category. Given that they don’t advertise what kind of battery is in the Flex Vac (though the charger is Energy Star approved, at least), I’m going to go by evidence and guess they’re trying to sidestep admitting they went with a cheaper NiCad battery. What evidence, you ask? A charging time that takes almost a full twenty-four hours and an okay but not great six-to-seven minute runtime. The Flex Vac is a little heavier than average at 3.8 pounds, but it quickly occurred to me when using the hose that weight is so much less of an issue with this vacuum. You never really have to lift the vacuum when you can stretch the relatively weightless hose! Black and Decker went with an above average filter, at least, which makes me feel better after the battery issue. It’s a three-stage system, dishwasher safe, and has a helpful refresh knob to clear the filter while you’re still cleaning. I am a little impressed that Black and Decker managed to get a good seventeen ounce capacity for the Flex Vac’s dustbin, considering that at first glance there doesn’t seem to be any room in the vacuum’s shape for the more bulbous shape of dust bin you might normally look for. The Flex Vac really shines when it comes to accessories. Not only are a crevice tool, a brush (especially useful for dusting high shelves) and a tool for working out pet hair included along with a storage carry so you won’t lose them, but you can also buy a set of mini-tools that attach to the vacuum head as well. Despite having a NiCad battery, this vacuum holds up pretty well. Of course, just make sure that you charge the battery properly if you happen to get one – an impatiently and improperly charged NiCad is a surefire way to ruin a good vacuum. Black and Decker went with a two-year warranty for the Flex Vac, which I’d say is about right for what it is – they could have conceivably gone with a one-year warranty for this price range, but I don’t think that would have been a good choice on their part. The Flex Vac’s price is, not to pun too much, one of its main selling points. True, there are other handhelds with flexible hoses out there, but those other companies seem to think they can charge an arm and a leg for the same design idea. The Flex Vac was a surprising find for me in looking in its price range. It’s got a design that you normally can only find on the more expensive end of the spectrum, and on top of that has the high-performance and accessories to go with it. Most especially, though, if you have an abundance of higher shelves, curtains, or blinds, or even just want to clean your car more conveniently, go straight for this vacuum.